Allan Linton lives and works as a Private Detective in Dundee, Scotland. One afternoon he is visited by a mysterious man who asks Linton to find a young woman for a large sum of money. He is given a lump sum upfront and £5000 to follow when he has information on where she is. The man only has a photograph to go on of a young blond girl in a school uniform, though Linton is informed that the girl is actually a brunette and that her name is Tina Lamont. With not much to go on Allan and his associate Niddrie set out to look for her, but it would seem that no-one has a clue who the girl is until Allan has an idea and asks an old friend for help. The case seemed straightforward, that was until a breaking news article leaves Allan and Niddrie shocked as to who the mystery man really was. Also, why are there two gangsters now making threats too? Ever wish you hadn’t gotten involved in someone else’s problems – Allan Linton is certainly feeling that way now! 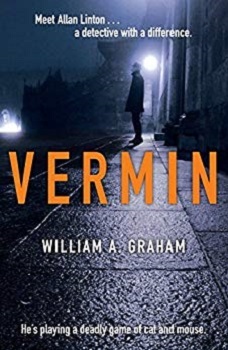 Vermin is a mystery, crime, mild thriller book set in the heart of Dundee. The plot is told in the first person (except for the prologue) and from Allan Linton’s point of view. Allan has a fun way of looking at the world and doesn’t take life too seriously. He is a divorced, father of one to his teenage daughter Ailsa, whose problems with an over-enthusiastic young man he has to deal with too. Niddrie is a strange character. He doesn’t say a lot, more the hard quite man, or a bit of a nutter according to a couple of young lads. There is no mention of him having a family and he seems to spend a lot of time at the local library, though he is never seen with a book. The story follows the case of a missing young woman. Why she is missing and what the person looking for her wants is discovered in small snippets throughout. You get to see Allan’s detective skills first hand. He also has some not very nice things to say about TV detectives and how they portray his job to the public. The chapters are short and the book was really quite amusing, from the opening line of ‘Henry Lewis MP Raised his left buttock just a few millimetres off the green leather bench and farted gently’, to the last page. The plot had plenty of depth to it and lots of twists, turns and red-herrings to keep you on your toes. The only bit I couldn’t work out was how the prologue fitted in with the story – I’m sure I must have overlooked something somewhere. I’m now hoping that we get to meet Allan Linton and his Private Detective firm again as I feel that Allan has more stories to share with us. Great review. It sounds like an interesting story. Great review. Sounds like one I might enjoy. Sounds like one that mystery lovers will really enjoy! Great review! It sounds hilarious and awesome! Awesome review! Sounds like a good thriller. I will for sure keep this on my Thriller TBR.